"The savings on two used buses from National Bus Sales enabled our district to purchase a third bus." "We purchased two buses from National Bus Sales last year and are so pleased with them that we returned this year for more." National Bus Sales had previously sold one of the nation's largest school bus contractors several bus packages. The contractor won an 80 bus contract in June and needed the buses by the end of July. National Bus Sales located, reconditioned and delivered the buses in time for the first day of school. "National Bus Sales has provided excellent buses over the years for our school district. The coach Bus was a great value with low mileage. The route buses have always been delivered as promised in both specifications and service." "National Bus Sales provided our school two top-quality buses. We were able to use the tax levy funds to replace the Carpenter buses in our fleet." "National Bus Sales is far and away the best used bus dealer we have dealt with in recent years." "National Bus Sales has consistently provided the best used school buses on the market." In March, a transportation director from a school in Iowa called Craig at National Bus Sales to inform him that another school district lost several of their buses in a fire. Craig contacted the school's superintendent to offer assistance with any short and long term needs. The fire destroyed 11 buses and other school districts had already loaned them enough buses to complete the school year. By May, National Bus Sales delivered six buses to the school and two more vehicles were delivered in July. They opted not to replace three buses. School started in August with all buses in place. "We were very pleased with the level of service and compassion we received from the staff at National Bus Sales. We feel like we received a great price on the bus package we purchased." 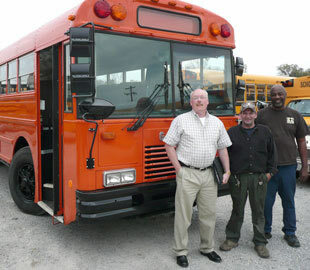 "With their superior customer service, National Bus Sales has been our exclusive source for late-model school buses." "We have a great working relationship with National Bus Sales. We purchased a bus that had a mechanical issue and National Bus Sales quickly fixed the problem. We were so happy with the service we received that we later bought a coach bus from them. It has turned out better than we expected." A large Tennessee public school system contacted National Bus Sales requesting 30 mini buses within two weeks to comply with the No Child Left Behind mandates. Due to our extensive inventory, National Bus Sales provided many of the buses within the two week deadline. "National Bus Sales went above and beyond to help us have as many buses in place as possible before the compliance deadline. The buses were delivered meeting Tennessee school bus specifications and ran great. We will use National Bus Sales for all of our future bus purchases." "Working with the professional staff at National Bus Sales has made my job so much easier." "No other dealer has been able to match the quality or quantity of buses acquired from National Bus Sales." "I really do appreciate the people at National Bus Sales. They worked hard to get me the bus that I was looking for. Brandon worked with me through the entire process to make sure that the bus I picked up was in great shape. The bus was in perfect condition and we feel like we purchased a bus that was worth more than what we paid. I recommend National Bus Sales to anyone who needs a good used bus." Larry Evans with Stand-By Personnel employees. "I would like to thank all staff from sales to service in the National Bus Sales organization for your response to our needs. From analysis in sales, to determining the size and driver requirements, to prompt delivery, your company has been instrumental in the continued growth of our organization."